Jimmy Talaska and Janice Taylor, research technologists at the UNMC Advanced Microscopy Core facility, work with the new Zeiss ELYRA PS.1 super-resolution system. UNMC has acquired a state-of-the-art microscope which increases resolution by three to 10 times what was previously available on campus. Keith Johnson, Ph.D., professor of oral biology and director of the Nebraska Center for Cellular Signaling (NCCS), said the new instrument allows UNMC to go toe-to-toe with academic health science centers across the world. "We're competing with the best," Dr. Johnson said. "This will put us in the game." 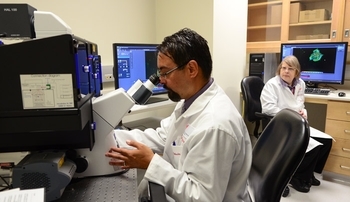 Nearly $700,000 in funding from a Nebraska Research Initiative (NRI) grant, plus additional monies from the NCCS, paid for a Zeiss ELYRA PS.1 super-resolution system, housed in the UNMC Advanced Microscopy Core Facility (encompassing both confocal and super-resolution imaging technology). Having it on campus gives UNMC a leg up in competition in research, for funding and in recruiting sought-after researchers to campus. This microscope's capabilities will be the gold standard in five years or so -- putting UNMC ahead of the curve in a field that is continuing to advance. Just last week, the Nobel Prize in Chemistry was awarded to three scientists "for the development of super-resolved fluorescence microscopy." "We're going to be able to distinguish between structures inside the cell that previously might have looked as though they were overlapping or in the same place," said Steve Caplan, Ph.D., the core director and professor of biochemistry and molecular biology. "Now we're going to be looking at a higher level of detail. This is crucially important for the fundamental understanding of how cells work." Surinder Batra, Ph.D., chair of biochemistry and molecular biology, will look to define the localization of mucins in pancreatic cancer cells, in hopes of better understanding their role in the progression of the disease. Kaustubh Datta, Ph.D., biochemistry and molecular biology, will study the formation and degradation of autophagosome in cancer cells in structural detail. Tammy Kielian, Ph.D., pathology/microbiology, will use it to identify intracellular trafficking perturbations in Juvenile Batten Disease. Carol Casey, Ph.D., internal medicine, will look at movement and molecular changes in lipid droplets to further study alcoholic liver injury. All this was not possible a few years ago. Said Dr. Johnson: "For 100 years light microscopy was limited by what people thought were just the fundamental physical properties of light. It seemed to be an insurmountable barrier, you couldn't get any better; 100 years ago the lenses were as good as they were going to get and resolution was as high as it was going to be. That's the end of the story. Then, some clever folks found a way to break that barrier." And now, UNMC hopes to break more. A seminar for interested researchers is set for Oct. 29 at the Durham Research Center, Room 1002. To learn more, please contact Dr. Caplan. Drs. Johnson and Caplan cautioned that while the Zeiss super-resolution system will be housed in the Advanced Microscopy Core, its use will be different than that of most traditional core services. Investigators won’t simply drop off a sample and pick up data, but will have to take a much more hands-on, interactive role in the process. Structured illumination microscopy (SIM) will increase lateral (XY plane) resolution from about 300 nanometers to about 100 nanometers, will be fairly user friendly, and attract a wide group of users across UNMC. It is the “basic” option, but doubles or triples what was possible previously and in most cases will be more than good enough. Photoactivatable light microscopy (PALM) is a more involved technique, requiring more training and commitment from labs that wish to use it. It results in extraordinary resolution, but may require someone within user labs designated to work on it. Stochastic optical reconstruction microscopy (STORM) uses the same physical principles as PALM and also will require a serious commitment from users. STORM allows labs to obtain data from endogenous proteins.